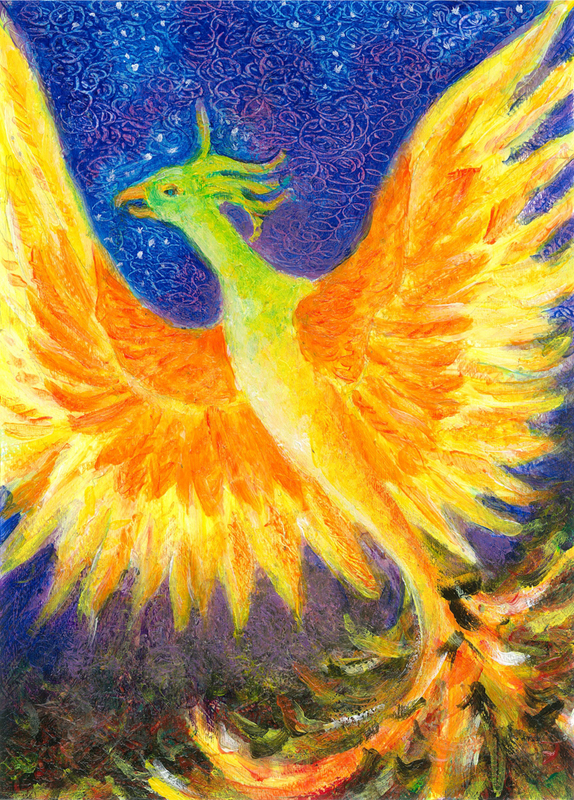 Phoenix Rising is a new painting for my Heni’s Happy Paintings etsy shop. The phoenix is a powerful mythical bird that recreates its own life from the flames and ashes of the past and arises to be reborn to fly again. Lately some of my friends and family members have been going through some very tough times including; serious health, relationship and financial issues. It helps me to think of the phoenix myth and trust that they will be OK. We have all been and will go through very challenging times in our lives. Those big challenges can help us grow to become clearer and stronger in our lives. From these experiences we can go forward with a new sense of ourselves, like the fiery phoenix rising from the ashes. Thank you so much Melissa, and thanks for giving me the idea! Heni – this is a beautiful and powerful painting! One of your best! Keep up the good work. Love your painting and such powerful and encouraging words! I think of the phoenix as Yin-Yang. Your painting captures the darkness + light in balance. Beautiful! What you wrote about on growth reminded me of how we’re held in the womb (darkness) to be thrust into this world (light). From now on, I’ll remind myself that tough times are really a time of birth…..a new sense of myself. Thanks, Heni. Thanks for your thoughtful comments. Yes, I can see how birth can be similar to death, both powerful transforming events. Your thought on Yin-Yang was coincidental because just this morning I was thinking about painting a crow and a dove together in a Yin-Yang fashion. I’ll check out “try” on YouTube. I just listened to Try and realize I’ve heard it many times, just didn’t know the name. Yes, quite synchronistic. Thank you for your nice comments! I’m enjoying your blog posts. Very striking painting and thoughts that accompany are so strengthening! Thank you, I really appreciate your comments! Thank you for linking, your writing is insightful helpful to me, especially with all that’s going on here in the U.S.